East Brunswick dentist, Dr. James Courey tells his patients that crowns and bridges made on dental implants should look and feel like your own teeth. 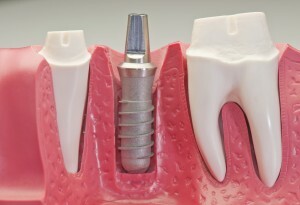 Dental implants are a routine part of modern dentistry – no longer considered "experimental" or even "new." They have revolutionized dentistry, and now they are tried and true. Studies have found that the success rate for today's dental implants is as high as 98 percent, with no or little discernable bone loss when managed by a dental specialist like East Brunswick dentist, Dr. James Courey. In the hands of a Surgical Prosthodontist, like Dr. Courey, they are a safe, predictable and most often preferred alternative to old-fashioned bridges and dentures. Implants improve your appearance, your speech, the ability to enjoy your favorite foods, your comfort and your self-esteem. Contact East Brunswick, NJ Dentist, Prosthodontist, Dr. James Courey.